Do I Need an Insulated Jacket? 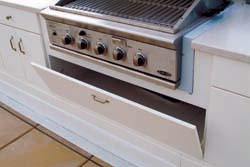 Q: I am working with a local cabinet company to design an outdoor kitchen using Starboard by www.kingplastic.com. Would you still need an insulated jacket when using this outdoor marine board? 1) The Physical Properties Sheet shows two temperatures limits for various physical properties of the material. The lowest is 84 degrees C, which is 183.2 degrees F. That is pretty low in grill terms. 2) The second clue is the photo of a grill in an island that they show on their website (see above). It is apparent to me that an insulated jacket was used. Accordingly, I advise you to use an insulated jacket with an island made from the Starboard or any other plastic type material. I do not think it prudent to run the risk of melting the structure that is supporting the hot grill.